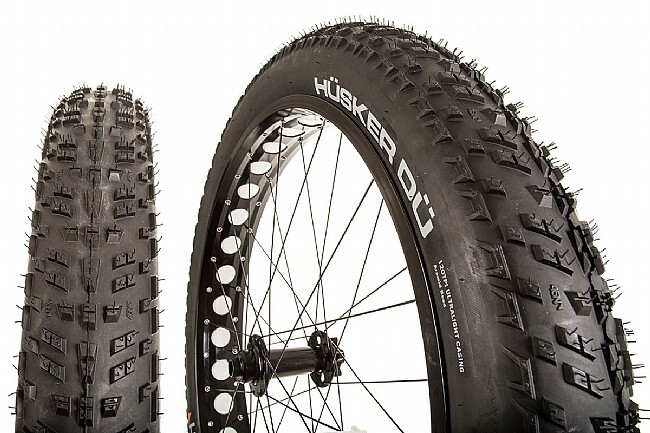 Keep up the speed on your fat bike with 45Nrth's Husker Du 26 x 4.0” tire. It features a lightweight aramid bead and a supple 120 tpi to keep things rolling fast and smooth. The center tread is tightly grouped for lowered rolling resistance while the shoulders are spread out and sharper to still let you hang on when you're carving S's in the snow. Tubeless-Ready version available Fall of 16'. I purchased a set of these when they first came out and was happy for the trendsetting lower weight and fantastic riding qualities. I later realized how fast the tread began to wear from riding in dirt. I sold that bike with two Husker Dus and purchased a new one with two Surly Nates. Bad idea. Although I had plenty of grip in snow, the increased rolling resistance was unenjoyable so I replaced the front with a new Husker Du and bingo: the perfect ride for groomed, moderately hilly terrain. The tire slips in fast cornering, loose snow but is otherwise plenty grippy. Highly recommend if wear quality improves, can't tell after two months in snow. Great tire, delivering as expected. I really like this tire as it rolls very nicely and seems faster than my previous Barbagazies. Need more time with them but so far so good. I did have a little more difficult time getting them sealed up with Stans. First ride with them required a few stops to put more air in. Since that ride they seems to have sealed up well.